If you are leasing a car, it is easy to fall in love with it and get attached. When this happens, you may find yourself not liking the fact that you have to return the keys at the end of your lease. Lucky for you, a lease buyout loan is all you need. What is an auto lease loan buyout? Can you finance a lease buyout? Should I buyout my lease early? A lease buyout loan is money that you get to purchase the car that you are currently leasing. You can do this either at the end or before the end of your lease instead of returning the vehicle. Getting a lease buyout loan not only allows you to own a car that you already know but also helps you avoid penalty fees for wear and tear or exceeding miles. How much has the value of the vehicle depreciated? How much is your end of lease fees? If you are thinking of getting a lease buyout loan, then the first thing you should do is review your original lease agreement to determine how much money it will cost to buy the car. Your original lease agreement should outline the purchase option price or residual value. By choosing to keep the vehicle, you will need the residual value amount as well as any applicable taxes and the Department of Motor Vehicle (DMV) fees. In addition to this, you may be required to pay an administrative fee to the company leasing the car to you to cover the transaction costs. To be sure that buying out the lease is the best option for you financially, run a simple search online on a used car website and check how the lease buyout price of your vehicle compares to the open market. Is There Hope for Another Loan After Car Repossession? The condition of the car – Is it in good condition? Remember, when you return the leased vehicle it will be inspected. Even though most car leasing companies allow for imperfections because of everyday use, the above average wear, and tear can cost you. There is no definite figure for these fees as they can range from hundreds to thousands of dollars. Mileage agreement terms – Have you exceeded the terms of your mileage agreement? Keep in mind that you will be subject to per mile penalties if you have gone beyond the limits and can accumulate when your lease comes to an end. For instance, if you have gone 10,000 miles over the mileage limit of your lease, you may be required to pay a penalty of as high as $2,500. Instead of paying all this you can use the money towards your buyout lease. Cost of maintenance – How much will it cost you to maintain the vehicle? How much do you spend on fuel every month? You can check this with your local car dealership or go online and do some research. After this, you should factor these expected ongoing costs into your decision to buy the car that you are currently leasing. The key advantage of buying a leased car is that you know exactly what you are getting. If you have been keen on taking good care of the vehicle, then you have a better assurance of its potential and quality as compared to buying a used car somewhere else. In the event that you dinged the vehicle up a bit or you exceeded your mileage limit, then you won’t have to worry about coming up with the fees to cover the extra costs since the car will soon be yours anyway. In addition to this, you will also be sparing yourself the time and hassle of shopping for a car. Do you know that it is possible for you to go from lessee to owner without necessarily having to get out of your house? Well, now you know. For you to qualify for the best lease buyout loan, you need to have a very good credit score with a perfect payment record on your leased car. Typically, you will be required to provide the same documentation as you would any car loan application. This includes the odometer and VIN reading. Your loan lender will also ask you to provide them with a copy of the lease containing the residual value. You can do your loan shopping online so that you don’t limit yourself and also get the best offer out there. There are a number of online lenders that offer lease buyout financing. With online loan shopping, you can submit one application and then receive up to four loans within just a few minutes. 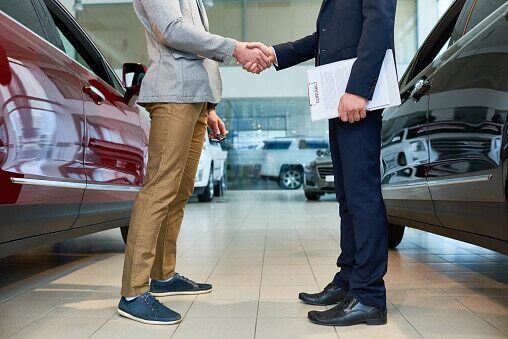 Since there are a lot of factors to consider including financing, residual value, and contract fees, buying your leased car can be a very tricky proposition. However, the good news is that after doing your extensive research and number crunching, you can simply turn the leased vehicle in and go get a better deal on another car elsewhere if your current deal doesn’t make sense. The answer to this is yes you can. However, you should know that financing a leased car buyout is the same as financing any used car purchase. You arrange for a used car loan, get a check written to the lease company for the amount of the purchase, receive the title then register the car in your name with your local DMV office. There is a possibility that you will pay sales tax and then you’re done. To simply put it, buying out the lease means that you are paying off your lease balance and purchasing the car that you have been leasing. You can either pay cash or get a conventional used-car loan from a credit union or bank. In many cases, you can get your buyout loan from the same bank or finance company that is responsible for handling your lease. However, this may not be the best deal. You can also get a buyout loan from an online service which specializes in loans for people who have credit problems. The approval rate of such lenders is usually easy and fast. Your new payments may be lower or higher than your previous lease payments depending on how far along you are with your lease. This affects your buyout price as well as how many months you want for your used-auto loan and the loan interest rate. Keep in mind that the interest rates for used-car loans for buyouts are a bit higher than for new car loans and it also depends on your credit score. Therefore, check your credit reports and score before you decide to buy out your lease. Ideally, this depends on the policies of your auto leasing company. While it can happen, the buyout is usually non-negotiable. However, this doesn’t mean that you can’t negotiate the best deal for yourself. After researching the vehicle’s fair market price, you can now start shopping around for a lease buyout auto loan. What you are really doing is looking for a refinance loan. Therefore, you might want to look around and compare loan pricing as you prepare to make the call to your leasing dealer. Just a word of advice, never call your lease dealer to ask about purchase options. Count on the fact that your lease dealer will call you and this puts you in a better position to negotiate. If you already have some pre-approved loan offer, then your lease dealer will most likely try to beat the best deal. You can also look for discount financing or a purchase incentive. If you cannot negotiate the buyout, then you should at the very least be able to get the purchase option fee waived. While most lease contracts allow for an early buyout, there are some that do not. In fact, some auto leasing companies might restrict the time period during the lease meaning you may have to exercise your purchase option. For instance, they may prohibit buyouts in the first few months and/or the last few months. For this reason, you should ensure that you carefully read your lease contract to determine if you have any of these restrictions. If you decide that you want to buy your car before the normal lease-end, then it is considered as an early lease buyout. Because of the way the amount of the payoff is determined, the early lease buyout tends to be more complicated than a lease-end buyout. The price is a combination of the lease-end residual amount, as stated in your contract plus the money you still owe on your lease. The amount that you still owe on your lease may be considerably higher than what you may think. This is because your low monthly lease payments have not kept up with the rapid depreciation in the value of your car. It may also be because your car leasing company recalculates your lease balance in a different way than originally calculated thus resulting in crediting most of your past payments to finance charges rather than paying down the lease. In some cases, it may be cheaper to wait and buyout your auto lease at lease-end instead of purchasing it early. Do not make the mistake of buying out your lease early when you are over mileage assuming that it will be a good way of you avoiding impending excessive mileage charges. Depending on the details of your particular situation, buying the car, you’re leasing at the end of your lease can sometimes be a good thing and sometimes not. Before opting for this, always compare and consider the other lease buyout option to determine if it is the right move. The lease-end buyout purchase price is typically the residual value stated in the lease contract. Depending on the policies of the leasing company, this price is often negotiable but not always. Therefore, if your leasing company is not willing to negotiate this price, then you must decide whether the price that is stated is a fair one to pay. Reasons for buying out an auto lease vary depending on your situation. You may have equity in the vehicle, and you don’t want to lose it, you’re facing some serious fees for wear and tear or going over mileage, or you have simple grown attached and are crazy about the vehicle, and you want to keep it. Regardless of what your reasons are, you may need to get a loan unless you have cash access for the balloon payment. However, getting a lease buyout loan with a bad credit score is not easy. But no need to worry that bad credit will hold you back because below are some steps that can help you find a financing solution. If this option fails then consider taking some time to build excellent credit. Purchase fees: Most leasing contracts usually include a fee for choosing to buy the car. State taxes: These are taxes that are imposed by some states on the buyout price of the car. The buyout price: This is the residual price in your lease contract. It usually states how much the car will be worth at the end of the lease contract. This will be your buyout price. Registration fees: This is the money you are required to pay for the car’s registration. Early termination fees: This is what you pay when you want to purchase the car when your leasing contract is not up, commonly known as early lease buyout. You will most likely be required to pay an extra fee for breaking your lease contract. All these costs considered you should contact your leasing company and find out the total buyout cost for the car. Keep in mind that you may be able to negotiate your buyout price. Once you have settled your total buyout cost the next step is to research your financing options. While personal loan lenders specialize in helping people with bad credit to get loans for whatever they need, the maximum loan amounts are often too low for a lease buyout. They may range from $2,000 to $ 5,000. Some auto loan lenders specifically exclude lease buyout loans from their lineup of auto loan products. There are also those lenders who simply require fair-to-good credit. The buyout option at the end or beginning of a car lease can be either a tool for damage control or an attractive opportunity. The leasing company is the one responsible for setting the buyout price at the beginning of your contract. Buying the car, you’re leasing can cut your losses if you are anticipating penalties and extra fees. Similarly, you could turn the hidden value in your vehicle into real savings if the market conditions have changed since you signed the lease and you’ve also lightly driven the vehicle. It might be time for you to stop being a serial leaser and your just tired of jumping from one leased car to the next and having to pay a monthly fee for a vehicle that is technically not yours. If you like the car that you are leasing and are considering buying it, then compare its buyout price to the retail price online and see if it is worth it. If the deal is fair, then skip the dealership and write the leasing company a check. If you can’t finance it out of pocket, then consider getting an auto loan from your bank, credit union or private lender. When you buy your leased automobile, it saves the leasing company both auction and shipping fees. This is why in some cases, the leasing company will contact you and offer a lower buyout price than the one in the contract. If you want to negotiate a reduced buyout price, you will have to talk to a lease-end manager working at the leasing company since they are the ones who usually have the power to approve lower prices. Banks that are writing leases may be most likely to negotiate when compared to automakers finance companies. Most auto lease contracts are for three years and 36,000 miles. Being under could have you leaving money on the table and being over could have you owing money to the leasing company. Why would you pay $2,000 or $3,000 for mileage penalties and still have nothing to show for it when you could just buy the car instead? Buying the car will also save you the disposition fee which is the charge that you normally pay for preparing the vehicle for resale. Similarly, returning a vehicle that you only drove 10,000 miles when you paid for 36,000 miles is like having the lease company a big fat check for free. Instead of going through either situation why don’t you just buy the vehicle and get value for what you have paid for. If the numbers break in your favor, since the low mileage vehicle is worth more than the buyout price, your leasing agency will purchase your lease and give you check for the difference. Lease buyouts can be beneficial but also break you financially. Therefore, you need to think about its benefits, consider your situation among the other things that have been mentioned above to avoid going in blindly.